The California Economic Summit’s goals have always been ambitious: As the state’s economy continues to get back on its feet, more than 700 public and private sector leaders from across California are working through the Summit to advocate for a concentrated, statewide effort to accelerate middle-class job growth—and address issues from growing income inequality to the environmental and economic challenges of climate change. It’s a broad agenda, and by necessity. The Summit’s prosperity strategy not only reflects the priorities of all of the state’s diverse regions, it also acknowledges that taking on any of California’s biggest challenges in the decades ahead is going to require taking on all of them simultaneously. As this partnership between California Forward and the California Stewardship Network moves into its fourth year, the Summit’s expanding network of regional champions has continued to make steady progress toward this goal, with the Summit’s big vision of a regions-driven state economic strategy—and its specific proposals for how to get there—resonating both in and out of Sacramento. “Looking back on our goals for the year, every one of the Summit’s major legislative proposals was accomplished this year—from new investments in workforce training and infrastructure to a permanent source of funding for affordable housing,” Summit co-chairs Paul Granillo, president and CEO of the Inland Empire Economic Partnership, and Eloy Oakley Ortiz, superintendent-president of Long Beach City College, told Summit participants before the Summit’s August Capitol Day. As preparations begin for the next California Economic Summit on November 12-13 in the Inland Empire, Summit leaders have spent the last few months developing a five-year plan that aims to build on these successes. The Summit’s new Roadmap to Shared Prosperity, scheduled for release in January, integrates the work of the Summit’s seven action teams and once again identifies the “right next steps” the state must take between now and 2020 to advance prosperity—from developing a workforce that can compete in the global economy to making needed infrastructure investments and encouraging the state to find new ways to fund these vital efforts. 1. Increased workforce training investments: This year’s state budget included $50 million for career technical education, adopting a new “shared investment” funding model championed by the Summit. It also emphasized the role these programs play in connecting workforce training with regional industry—one of the Summit’s top priorities, along with improving connections between the building trades and infrastructure projects. In November, the California Community Colleges Board of Governors established a new task force with a mandate to make the system even more responsive to the state’s economy, crediting the Summit with helping lay the foundation for this effort. Separately, lawmakers also included $250 million in the budget for the Career Pathways Trust, a work-based learning grant program supported by the Summit. 2. Enhanced infrastructure financing tools: The Summit helped craft legislation that will dramatically expand local authority to invest in infrastructure projects—from building transit stations and upgrading water systems to maintaining roads and sidewalks. After being signed into law by the governor in September, these new Enhanced Infrastructure Financing Districts (EIFDs) can be used for the first time in January. The Summit has scheduled meetings in early 2015 to help cities and regions identify projects that could benefit from this new authority—including a “Meeting of the Minds” webinar scheduled for January 13. 3. Expanded manufacturing partnerships: A Southern California aerospace consortium supported by the Summit was named one of 12 new “manufacturing communities” by the U.S. Department of Commerce in May—a new federal designation that will make the region’s public and private manufacturing partners eligible for $1.3 billion in federal funds. Several other Summit-supported groups are planning to seek this designation in the next round. 4. Targeted funding for affordable housing: While Summit leaders have continued to make the case that state investment in affordable housing is at a 30-year low, the state budget this year did take an important first step toward finding a permanent source of funding for affordable housing. It included $100 million for affordable multi-family rental housing, a proposal supported by the Summit. It also directed 35 percent of all future cap-and-trade revenues to transit, affordable housing, and sustainable communities—a source of funding that could grow to as much as $1 billion annually. Housing alone will receive at least 10 percent of all cap-and-trade funds every year. 5. Highlighted regulations in need of streamlining: In the midst of an unprecedented drought and a broad administrative review of the California’s environmental regulations, the Summit deployed two teams to highlight regulatory changes that could help the state achieve its environmental and economic goals. One team developed a set of recommendations for streamlining the water transfer process to support communities most impacted by the drought, while another advised the governor’s Office of Planning & Research on how updates to the California Environmental Quality Act could accelerate city-centered infill development. An additional team was created this summer to concentrate on how the state could expand its use of open data. 6. Piloted new investment network for small businesses: The Summit continued its work to expand access to capital for small businesses, partnering with federal agencies and statewide small business associations to begin creating a database of capital intermediaries in every region. In early 2015, the Summit will select three regions to serve as “living laboratories” for improving access to capital in underserved areas. This summer, Summit partners in Chico launched the first pilot program in this effort—the California Finance Consortium, which will serve as a regional source of information on capital investors for small businesses operating in California’s 22 northernmost counties. 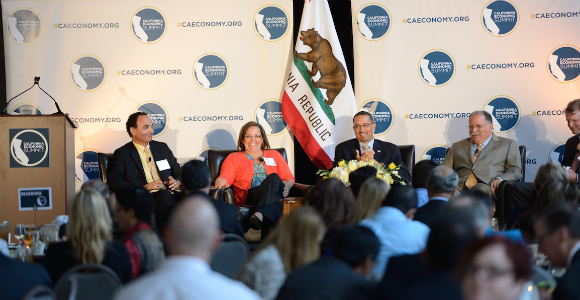 In November, the Summit and CA Fwd also joined the White House's "Investing in Manufacturing Communities Partnership" in co-hosting an event on growing the “impact economy” in California—creating action teams that will work to expand the number of "for-benefit" corporations and widen use of "Pay for Success" models to support public programs. 7. Improved preparation for next drought: With drought worries escalating last winter, the Summit also advised state and regional leaders on how water policies adopted during the water crisis could help put the state on a path to water sustainability. Many of these ideas were adopted this year, from a $700 million drought relief bill that supports regional water projects to the $7.5 billion water bond approved by voters in November and the state’s dramatic expansion of its groundwater management system. The Summit’s efforts to encourage state support of multi-benefit, integrated water projects that address issues across watersheds were also reflected in an update of the California Water Plan released in October.